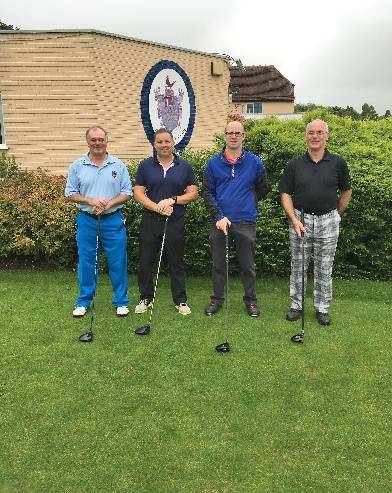 Leek Golf Club’s captain, Andrew Baxter, hosted this annual Charity event to raise much-needed funds for the Peter Alliss Wheelchair Crusade and Cancer Research UK. 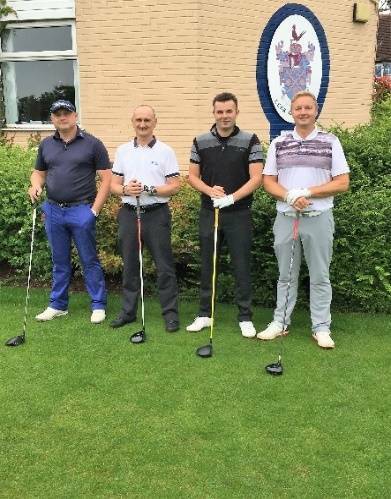 41 teams of 4 (164 players) teed off from 8.30am and continued through until 15.20pm, playing a friendly 2 from 4 to score format on 16 holes, with a slight tweak of having to score the best 3 on the 6th hole, and all 4 on the 17th hole. The weather was a mixture of sunshine and showers, and the previous days’ rain had played havoc with the course and greens, making the course difficult to set up by the greens staff. However, they rose to the occasion and did a great job in their preparation of the course infrastructure. The captain would like to thank John Turner and his staff for their commitment on the day to get the event up and running. The captain started proceedings as Mr. Starter, followed by Mike Wootton and Arthur Doherty. The day flowed very well, all players teeing off on time, and running at a reasonable pace. At the half-way house refreshments were supplied by Ivor Povey, which certainly kept everyone energised for the back nine holes. Some players enjoyed their own liquid refreshment, much to the amusement of the helpers at the time! The ladies did a superb job in hosting the half-way house and the captain was extremely grateful to Carole Nixon, Margaret Whitfield, Pauline Swindells, Karen Wilshaw, Dave and Jackie Gallimore for their help, enthusiasm and personalities. Play continued all afternoon on schedule, and concluded by about 8pm. Several groups dined after their games, recounting the highs and lows of their rounds. One such player, Jayne Baxter, certainly had cause to celebrate the fact she had achieved an eagle on the 6th hole! During the whole day a band of helpers sold raffle tickets for the respective charities, and thanks are extended to Jayne, Ann Titley, Clare & Izzy Robinson and Ivor Povey. 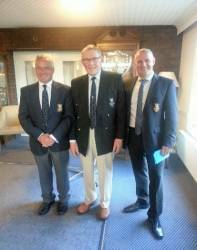 When everyone had assembled for the presentation, the captain expressed his sincere gratitude to all the sponsors, office staff, Greg Rogula and Jake, catering and bar personnel, but most of all Ivor Povey. Ivor has run this show for nearly twenty years, raising tens of thousands of pounds for the captains’ charities. It is a fact that without him these events would not have been successful as they are. His work ethic and ability to maximise the occasion is second to none, and Leek Golf Club is very fortunate to have a person of his calibre supporting this annual day of celebration. 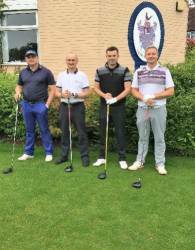 Patrick Leatherbarrow, Dave Robinson, Pete Nixon & Craig Stanier 91 Points, back 9 of 46. Dave Fowler, Steve Matthews, Dave Griifths & Adrian Briggs 91 Points, back 9 of 42. 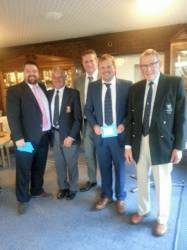 Phill Davies, Dan Smart, Blake Norton, Malc Wells 85 Points, back 9 of 45. Stewart Townsend, Ian Townsend, Mark Shea & Peter Cordon 85 Points, back 9 of 44. Traditionally after the prize presentation, Ivor presented a state-of-the-art wheelchair to a deserving disabled pupil of Horton Lodge, the funds for which are raised from the hard work and activities of all involved in this charity day. This year’s chosen recipient was five-year old Megan. 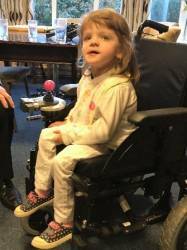 She arrived in the wheelchair itself, accompanied by her mum and dad, a scene which definitely was emotional for all. Ivor gave a moving speech about Megan’s life, and the support services around her. He added that without doubt this part of the captain’s charity drives him on each year, and motivates him to get the best results for disabled children of Megan’s nature. As you can see from the photograph, the wheelchair has a bright pink golf ball control stick! All in all, this was a superb day, with brilliant organisation, fantastic support and amazing generosity from members and friends of Leek Golf Club. I am really proud of what was achieved on the day, and feel privileged to be involved in these worthy causes in my year of office.